Okay, okay. We know that this is stupid. But we still think it’s kind of amazing. Picture this: you’re sitting around the tv with a group of friends. A generous soul goes to the fridge and returns with beers for everyone. That generous soul has forgotten a bottle opener. Everyone groans. Here to save the day: the bottle opener remote control. 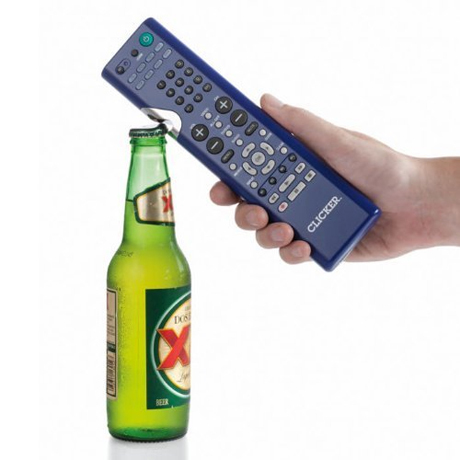 With the bottle opener remote control you can easily transition from popping open a six pack of imported nectar of the gods to changing the channel in seconds to that enthralling Honey Boo Boo TV show. Yeah, definitely. Nothing says “I have street cred” like tenderizing your meat with a pair of brass knuckles.